Comprehensive K-12 program, focusing on math language concepts and constant repetition. 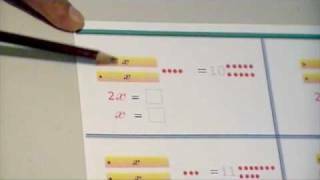 Learn how to teach your child math at home. Highly regarded program for parents and teachers, learning to help children develop concepts with use of manipulatives. Learn about Numicon manipulatives and program for early learners (also used for visual or special needs learners.) These materials promote tactile, visual and proprioceptive learning. Have been promoted for children with Down Syndrome also. The only US retailer is the Down Syndrome Education Store but check Amazon for some new and used products for sale. Multisensory program that uses its signature TouchPoints to engage students of all abilities and learning styles. Popular and effective lower cost complete instructional program, using manipulatives that help the student to visualize concepts. Comes with teaching videos, teacher guides, student workbooks, placement tests, etc. For all types of learners. Goes from early learning up through high school math. This is a nice tool for students who need to use their hands to build concepts. It’s a large rod with colored rings, which the user slides along the math line – for all basic operations and other skills such as money, rounding, and more. This tool is relatively inexpensive and engages the student through tactile, visual, movement and logic. Buy the larger one with four lines to do decimals, fractions and percents. Also offers free downloadable or viewable powerpoints, videos and sample lessons. Find standards-based math activities you can make to do at home or in small or school groups. They also have lots of good charts and templates to help those students with dysgraphia, organization, and concept building, such as 100’s charts, function machine templates, multiplication/division triangle card printouts, and many more – all for free! Downloadable online color pdf’s for printouts of materials. (Also available at Kaleidoscope) Offers step-by-step, easy to follow, few problems per page, help for students with LD or for basic intro or review of fractions, decimals, measurement, percents, geometry, measurement, and algebra. Designed for adult and ‘out-of-school’ teens but useful for anyone who needs a remedial or review of basic math skills geared toward independent living skills such as balancing a checkbook, reading a graph, common measurements, using mental math, and other basic math skills, such as fractions, decimals, and ratios. Inexpensive workbooks. Right Start Mathematics uses the AL Abacus and number balance, as well as other materials, to provide a visual, auditory, and kinesthetic experience in learning math. Purchase the DVD, manipulatives and the booklets for around $100 to take your child through 3 levels of algebraic equations (for grade 3 to grade 9) which use a scale, colored pieces and a grid to help students visualize equations. Check out youtube videos to see a demo. Online site with charts, pdf’s, powerpoints, and worksheets that can be viewed online, downloaded, or printed out – with good visual charts and directions of how to do most fraction tasks. Inexpensive book uses rhyming words, pictures, stories, and activities to teach the times tables using several teaching modalities. Purchase the relatively inexpensive DVD and/or book to teach math facts through a visual/spatial technique for ‘right brain learners’. Popular series for algebra, trigonometry, and more. It reads more like a story with clever ways to look at the material. Many parents recommend it for students with Asperger’s or more auditory learners, rather than visual spatial learners. Look for it at Amazon or other book stores. Great collection below of easy to use, beginning, or adapted online activities (free) and inexpensive i-phone/i-pad applications. Yes, it is in German but you should be able to easily understand this intuitive program. Math Tablet – tap to add virtual discs and then move them between two sides to learn number concepts and addition and subtraction facts. Search their website for apps for math reasoning and basic skills. (See pre-algebra and algebra apps in end of this section. Using visual representations and animations in ABA form for each topic, with very little need to understand language, users can find answers with this graduated training for each operation or concepts in fractions, multiplication, division, and decimals. Three progressive programs with options to use either U.S. or Canadian currency: Counting Coins, Spending Money, and Making Change. Add or subtract coins for visual money amounts in Count Money app. See correct placement and do easy carrying with apps for addition, borrowing with subtraction, multiplication, and division. Interactive online manipulative for making 3 different equivalent fractions with views of each fraction as a square with shaded parts, as well as a numberline which shows the place of each fraction. Full program of math tutorials for whole number operations, with explanations, practice, and games that cover addition and multiplication tables, basic operations including alternative algorithms, place value, rounding and estimating, patterns and sequences, word problems, time, money, length, area, volume, pictographs, bar graphs, and probability. Hands On Equations Using balanced scales, elementary and older students can build equations with a scale and tokens for unknowns and integers, all the way from simple equations through complex equations. “Braining Camp Algebra” Offers interactive tutorials, virtual manipulatives, and practice activities for each topic above: integer tiles, algebra tiles, solving equations and simplifying expressions. Software program for introducing fundamental math concepts for beginning math students or those with learning disabilities, through visual and fun activities. Computer program that helps children and adults organize, compose, and calculate using graphic organizers, click-on features, and visual support. Computer program (Classroom Suite) with Intellitools and Activity Exchange activities geared toward students with disabilities such as blindness, Down Syndrome, Autism, Cerebral Palsy, and other learning or developmental disabilities that require multi-sensory and differentiated curriculum or assistive technology to learn. Can be purchased for classroom or home learning. Offers all academic subject areas. Math covers basic math skills. This program is downloadable from their website for a very small fee for each set of ‘flash animated’ lesson and worksheet sections. It uses a highly visual method, almost without needing verbal instructions, teaching through scaffolding: highest visual content moving toward three other levels of less visual scaffolding as the child builds his/her ability (and also then is customizable for each student by adding in or taking out certain scaffolding levels. You can also watch lots of free samples online or view free videos adapted from their downloadable program (see below.) This program was originally used with deaf children but it is workable for typically developing children and those with LD or other disabilities. Very low monthly fee for software that teaches complete elementary fraction skills in a visual, multiple-models method with visual ‘scaffolding’ for initial study of the concept that eventually drops away to just the number problems. Game-based math program for K-5 Call 877-451-7845 for pricing for home use. Lower monthly fee for access to specialized online math learning with visual support and games. Excellent visuals for vocabulary, concepts, and procedures, with definitions, instruction, and/or demonstration of concept or procedures, with some practice. Use the Ten frame game to practice facts to ten in a visual way, with several modes & tasks. Balanced scales approach to adding and subtracting basics. Large, customizable (count by 1′s,10′s, 100′s, decimals, integers, etc.) Drag blocks to hide numbers to test yourself or a student. Use this interactive numberline to practice skip-counting, math facts, or to visualize any type of numberline (including decimals) and customize it by starting number, increment, and by ‘hiding’ points on the line. www.learningbox.com/Base10/BaseTen.html Place tens and ones blocks for given number. There are many great interactive games, models and practice activities here! Have students model and solve problems with virtual blocks, as well as try out other activities. Great games, activities, video tutorials, and interactive visual manipulatives for learning math concepts. Do games, activities and simulations for math topics, such as number concepts, data, geometry, algebra, and measurement. Or try your hand at puzzles or use their illustrated dictionary. Comprehensive website by the National Council of Teachers of Mathematics offers extensive activities, lessons, standards and links for all math areas, helping students, parents and educators. Targets multiple learning styles. These interactive online activities are for K-12 students. Users of this site can do their math work on the computer by ‘dragging’ numbers into a grid for all operations. May be useful for those with dysgraphia or other disabilities. Harcourt School Publishers E-Lab – around 30 interactive activities for each of grades 3, 4, 5, And 6, in the areas of number sense, algebra and function, measurement and geometry, and statistics, data analysis, and probability. Middle School Math – Free sampling of pre-algebra regular curriculum but with visual interactive activities (topics such as bisection, area, integer multiplication, rounding, rates, and more.) Get access to all lessons with a short term ($10) or year long membership ($50) for up to 3 children. Free online learning and quizzes for students who have issues around doing written tests – on many math topics for different levels, including all basic operations, geometry, measurement, and time. Search for quizzes others have created. Program created by a former classroom teacher, this program uses humor and story to explain math concepts. This program has been recommended by parents of children with Asperger’s and to those who haven’t learned math with other traditional programs. Purchase directly from supplier or from Amazon. By Jean Stenmark, Virginia Thompson and Ruth Cossey. Order through the museum, Amazon, or your favorite bookstore or available in libraries or homeschool resource centers. Great hands-on activities for tactile/kinesthetic learners – building concepts in fun family activities. 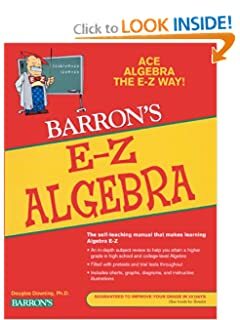 Non-intimidating algebra activities for enrichment, algebra class preparation or for homeschool math group. Loads of useful types of free downloadable or customizable specialty graph paper which can be used for those with writing disabilities or for help with organization and comprehension by use of these as templates. Printable templates for graphs, numberlines, scatterplots, trigonometric graph papers, polar graph papers, and more. Downloadable and printable templates for many purposes, including templates for hundred board, place value, triangle cards (for math facts) lattice multiplication charts, function machines, data analysis, logic grids, integer mat, and coordinate grids. Downloadable and printable template for 1′s, x’s, and x-squared pieces for modeling algebra problems. All kinds of graphs and grids for math – choose different size grids in a variety of colors to print.